"...there are, without a doubt, many of us who wake up with good intentions, but as we proceed with our day, impact others in devastating and destructive ways—and it is the impact, not the intention, that lasts. Therefore it is the road from those intentions to those impacts that we need to be critical of, that we need to better understand, that we need help deconstructing so we can lessen, avoid, or even stop, each other from delivering those harmful impacts." I've been trying to examine the road from good intentions to harmful impacts ever since I read those lines, and that has led me to question the notion of a safe space. Question 1 - Safe for whom? Whose experience of "safety" are we concerned with? Question 2 - What do we mean by "safe"? Safe should mean, "I won't get attacked for what I say" or "I won't get fired for what I say" (pausing here to note that many, many people have been fired for doing anti-racist work; this concern is real). I think we White people are seldom actually worried about those things when we talk about "safe spaces". Sure, sometimes, we are. But unless you go "old-school racist" (what we here at Reading While White refer to as bigotry) or hard-core anti-racist, we White people are pretty much safe from physical attack or job loss as a result of a conversation about race. -Saying "well, just to play devil's advocate..." which is really just a passive aggressive of saying what I truly think, without having to own it--why would anyone want to advocate for the devil? -Saying "hang on, let's pause and take a deep breath and look at this calmly," invoking the White luxury of reacting intellectually, rather than immediately and emotionally, to racism. -Launching into an angry tirade, describing how I've worked hard to get everything I've got/got passed over for a promotion because of affirmative action/am marginalized along another identifier, as if any of that erases my Whiteness. -Burst into tears. This is really real. Watch for another post from me in the future devoted entirely to this subject. All of these are tactics I can use as a White person to, intentionally or involuntarily, thwart someone's attempt to interrupt White privilege. All of these actions demand that energy be expended to comfort me, or play by my White rules, rather than actually acknowledge and discuss the problematic nature of whatever it was I said. And these actions are especially frustrating for people of color and First/Native Nations people who find themselves in the position of having to take care of someone who just said something problematic. Let's face it. 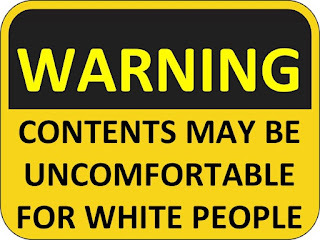 Usually, when White people talk about a "safe space", what we really mean is "a space that is comfortable for me." Or, to take it a step further, "a space in which other people censor themselves to protect me." To paraphrase: "A space that is comfortable for White people and unsafe for everyone else." So let's stop worrying so much about creating comfortable spaces and worry more about whether our spaces are truly safe for all. Yes, be careful before you say something that might get you fired. But creating a space that is truly safe for people of color and First/Native Nations people often necessitates making that space uncomfortable for White people. The world needs more uncomfortable spaces. I hope Reading While White becomes one of them. I have been trying to think of the ways we, as White people, demand safe space in regard to children's literature. I think it sometimes comes through in the rush to protect White authors from criticism when they have written about people of color of First/Native Nations, and then have been criticized for it. Why do you think so many White people have this knee-jerk reaction? And then there is the question does the story do harm if it is told? I'm Irish--from and raised in Northern Ireland, but I now live in the US. Irish characters in books, the words/phrases they use, are so often not accurate. And they often fit a stereotype. I no longer read these stories. In general they do no harm, I'm just not going to read them. But they are also not for me. If I want truths about where I am from I will read a book written by someone who grew up in my culture. For me, and this is only my opinion, it is fine the other books are there. Maybe they spark interest for those that want to look further, as long as they do no real harm. Is the drunken Irish stereotype really harmful--maybe, but in general I ignore these inaccurate representations. But the stakes are higher for people of color and First/Native people. I wonder what stereotypes are put into books about people of color and First/Native nations that do real harm? Stereotypes we don't even realize are there doing more harm than we can imagine. This is super-helpful, Allie Jane. Thank you. I'd like to make it part of our White Conversations for Racial Healing resource list, and going to forward it around to a few people I've tried to say this to recently. Very clearly-said. I appreciate your thoughtfulness and honesty sharing your thinking as you ponder this, Moyrid. I do agree as you and KT note that there is a gut-level response to defend and protect, and trying to understand what is behind that is important to me because I want to know how to get beyond that barrier. I often find myself thinking in my head, "What are you so afraid of?" when I read cultural critiques of books. I also sometimes need to ask it of myself when, as sometimes happens, my own first response to criticism of a book I really like is to want to minimize it. I have learned to check myself--it did not come naturally, and it isn't always easy. Understanding that the "stakes are higher" for people of color and First/Native Nations people is not a point that all White people are at, obviously. It's a point I feel like I'm always relearning, in fact, as I work toward broadening my own understanding. It hurts for a writer or artist to hear negative criticism, I have no doubt. But is their pain of greater concern to many than the pain of those who say, "This is hurtful. This is harmful"? And does the criticism trigger a sense of shame in reades? Do people who are quick to defend a work from such criticism think they are bad for having liked it? Is it a sense of loss? Fear of having to give something up? I imagine the answer varies. But in addition to learning to listening to such criticism openly--to consider it thoughtfully and ask what we can learn from it--I wish we could also all take a step back and see how much we as a profession, and especially children and teens, have to gain from it. If writers and artists and editors and publishers and reviewers all began to truly internalize such critiques, what an impact it would have on books for children and teens. Your "we" here is generous, K.T. I can't imagine you having a knee-jerk reaction to much of anything. I always appreciate your thoughtful, knowledge-based contributions to any conversation. Allie, I love the audacity of your posts, and in this one especially, the last line about intentionally creating uncomfortable spaces. This conversation is superimposed over the ongoing conversation about the video of the girl thrown across the classroom in her school. I'm sure the officer was hired with the intention of keeping the school "safe"--a stark contrast in levels of discomfort in these two conversations, to say the least. I don't think Google recognizes me so I'll sign this. A thought on "this book is not for me" -- I see that a lot from adults who find something in a book and set it aside, saying "this book is not for me." That is a luxury children do not have when the teacher is reading aloud at storytime, or when they are assigned to read a book. Debbie, I have visited your blog, and thank you for writing it. Thank you so much. If only everyone would visit your blog. Oh, I do have this reaction, too, Helen! I think my first instinct is nearly always to want to defend White authors and illustrators who are criticized, and I am trying to understand that reaction. Sometimes it's because I am friends with the author or illustrator and, of course, that's understandable because I don't want to see them hurt. But that's more of a personal response than a professional one. Other times, it's because I admire the author or have admired their previous works and I don't want them to "do wrong." In these cases, I find I get defensive as my first reaction. Why? Is it because I empathize with them as another White person who could make a similar mistake? I have been trying to bring my response back to the work itself and to weigh the criticism with the work and potential readers in mind, rather than the author or artist. But that's hard to do! The children's book community is very close-knit and it's hard not to think of the people involved. We want the field to be a safe place for them, so when someone criticizes their work, especially on racial terms, it's seen as an attack. I'd be curious to hear from other White people who find themselves having similar responses. How do our personal feelings get in the way of true criticism? On the idea of hurtful or harmful books: I've noticed that this is an idea that rubs a lot of White people the wrong way. During the whole HIRED GIRL discussion this past week, I remember seeing a declaration from a White person that read: "The only way a book can hurt me is if it falls on my head." Well, how nice for you. You live in a cozy, safe literary world, and I hope no books fall on your head. But that's not the case for all people. I have a Native friend whose 4th grade daughter suddenly started to hate school. She got stomach aches every morning and it was a struggle to get her to even go to school. She was a kid who was already having difficulty with reading, and her parents had had many meetings with the teacher about their daughter's progress. (Their older daughter had had the same teacher and she had sailed through 4th grade as a straight A student.) Finally, it came out that what had made the younger daughter begin to hate school so much was that the teacher was reading aloud THE INDIAN IN THE CUPBOARD. The book made her feel ashamed and embarrassed, and as the only Native student in her class, her classmates began to tease her about it. When my friend raised this with the teacher, her response was, "We have to read it in 4th grade because in 5th grade, they read the sequel." Do you want to tell me this child was not harmed by a book? The 4th grade classroom was not a safe place for their younger daughter, so my friend withdrew both daughters from public school and moved to the Menominee reservation. I think that some of the defensiveness is cultural, that is to say, White cultural, because White culture asks us to ascribe to a perfectionist way of seeing the world--a worldview in which criticism necessarily undoes us. I've learned from my anti-racist teachers to counter this with a "Yes, and..." approach rather than a "Yes, but..." approach, which is what we White folks usually default to. So, for example, I might say "YES, Julie of the Wolves is an engrossing read, and it's got a powerful girl who really spoke to me as a child, and it made me love wolves, AND it misrepresents Inupiaq culture and perpetuates stereotypes of Inupiaq people and therefore can do real harm"
...as opposed to "YES, Julie of the Wolves is an engrossing read, and it's got a powerful girl who really spoke to me as a child, and it made me love wolves, BUT it misrepresents Inupiaq culture and perpetuates stereotypes of Inupiaq people and therefore can do real harm." The former holds multiple truths at the same time and does not assert that any one of those truths cancels out another. The latter is more of a judgment. Person 1: "Julie of the Wolves misrepresents Inupiaq culture and perpetuates stereotypes of Inupiaq people and therefore can do real harm." Person 2: "Yes, BUT it's an engrossing read, and it's got a powerful girl who really spoke to me as a child, and it made me love wolves! So, I'm going to keep recommending it!" Person 1 is not asserting that any of Person 2's points are untrue, but Person 2 is reacting as if Person 1 did. Person 1 is asking for recognition of the fact that Julie of the Wolves is problematic in certain ways, in essence, asking for recognition of pain experienced. Person 1: "Ouch! That car just hit me! Look, my leg is broken! Please take me to the hospital!" Person 2: "Yes, BUT the car is so beautiful and she executed 95% of the curves flawlessly and she's inspiring me to love driving! So, no hospital for you, and this driver should keep right on driving!" We White folks need to start seeing criticism for exactly what it is, no more, no less. This makes us uncomfortable because it runs counter to White culture. The "yes, and" tip has helped me immensely. It helps me see that a criticism is not a negation of my entire being--it is an "ouch" moment for someone else, and I need to listen to it. Recognizing criticism for exactly what it is has helped me up my tolerance for discomfort. I've nowhere NEAR arrived, and I have lots of work still to do, AND (not but!) thinking in these terms has helped me appreciate how a space can be simultaneously safe and uncomfortable. NB--While I was writing this, I twice had to go back and edit points where I myself had used a "yes, but" framework instead of "yes, and". !!!!! Allie, just have to say that I love your analogies. The one you used above about the car accident really drives the point home (no pun intended). KT I'm speechless. There are no words to express how awful that is. knowing that race is a hard topic, we can all think about how to make the conversation as safe as possible for everyone--and I don't mean (only) safe for White people--without wimping out on the tough stuff. When I use punctuation like that, and see the careful construction of other people's sentences here, I wonder who we are excluding. Who has something to say and doesn't say it because they are worried about misspelling a word or making a punctuation error? If someone tried to enter our conversation with non-standard grammar or spelling, would anyone point it out? There are all kinds of power and uses of it. Maybe in my first comment to you, K.T., I only meant that I associate your name with kindness and thoughtfulness, and I think that goes a long way in making a space safe for exploration of challenging topics. Thank you (everyone here). I agree. This is the kind of thing that, to quote Megan Schliesman, "should be unbearable to us all." This school was not a school--it was an oppressive force. And the child is a survivor. We heard this a lot last summer when we were finally successful in getting a Redskins mascot changed in our community. Huge uproar and many denials that anyone was being hurt. Many felt that if there was no intention to do harm, no harm could be done. I knew of specific hurt that had been caused; it was a private matter to the injured people, so I didn't speak about it publicly, but it made me ferocious and tenacious (20 years) in working toward this change. Ultimately it was the school board and superintendant who came to the conclusion that it was the right thing to do, and they set the process in motion for a change to occur. Books can do harm and we are right to have these conversations as we work out the knotty problem of how to expose racism without re-teaching it.